Feminism is on the rise with our first woman presidential candidate, so I thought that it’s the perfect time to talk about yoga and feminism. My guest today is Beth Berila,yoga teacher, is the Director of the Women’s Studies Program at St. Cloud State University and is part of the Yoga and Body Image Coalition. Women learn from a very young age that our worth is often discerned by how we look. Regardless of how loved we are as children, we are saturated with harmful media messages. Even the people who fit the “standard” still don’t feel like they are enough. Yoga can help us disrupt those standards and give us a more empowered way of relating to ourselves and each other. Hear Beth’s challenging statement, “Our self talk is ALL learned self talk.” Yoga helps us recognize that our story lines (monkey mind) are not the truth. We come back to our wholeness underneath our learned behaviors. You’ll love her four step process for moving towards wholeness in a yoga practice. Feminism teaches us about social construction of beliefs. Our clear, empowered self is often mired in issues about body image, racism, homophobia, etc. Hear her own story about how feminism helped her find her voice, but also how yoga helped her come out of her head and into her body. And I LOVE our conversation about the process of change-making! 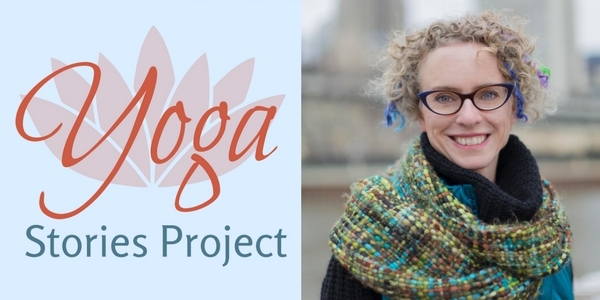 Find out more about Beth at her website here, and check out the Yoga & Body Image Coalition! What’s your biggest takeaway? Start the conversation in the comments below. Thank you so much for reading and listening! Please be sure to tell a friend about the podcast today.